January 2009 "With This Magic Net, I Can Catch Anything That Flies Out-Side Of An Airoplane!" CLICK HERE to see Howard Thurston's Pigeon Catching Net! 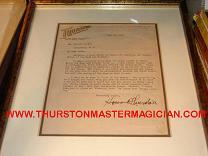 February 2009 CLICK HERE to see Howard Thurston's Robe from 1903! March 2009 CLICK HERE to see Howard Thurston's DeKolta Chair and matching table top! April 2009 CLICK HERE to see one of Howard Thurston's illusions for productions. It has some great designs! 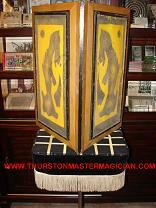 These are Howard Thurston's Production Lantern's from 1912, that were also in John Hilliard's Collection. 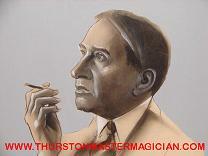 July 2009 This is an original drawing of Howard Thurston done by HARDIE. Howard Thurston used this drawing in numerous publications. CLICK HERE for more information. An amazing letter from Howard Thurston to Servais LeRoy, from August 28, 1923. An almost life-size photo of Howard Thurston that was owned by Lindhorst. Thurston Item Of The Month! 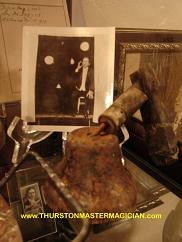 A spirit bell that was used in Howard Thurston's Spirit Cabinet. This bell was found in the famous Heaney Barn. 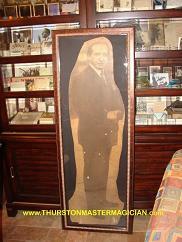 A board from a packing crate that was used to protect Howard Thurston's illusions. This board was from a crate found in the famous Heaney Barn and was removed from the full crate. It has JANE THURSTON's name on it! Thurston pulling a rabbit out of a hat!